Six months after Miriam Carey (pictured), a 34-year-old Mother, from Connecticut was shot dead in the nation’s capital under questionable circumstances, her autopsy report has finally been released. Carey was shot five times, including once in the back of the head, according to the report. Video of the shooting indicates that officers fired at least seven rounds at her vehicle. 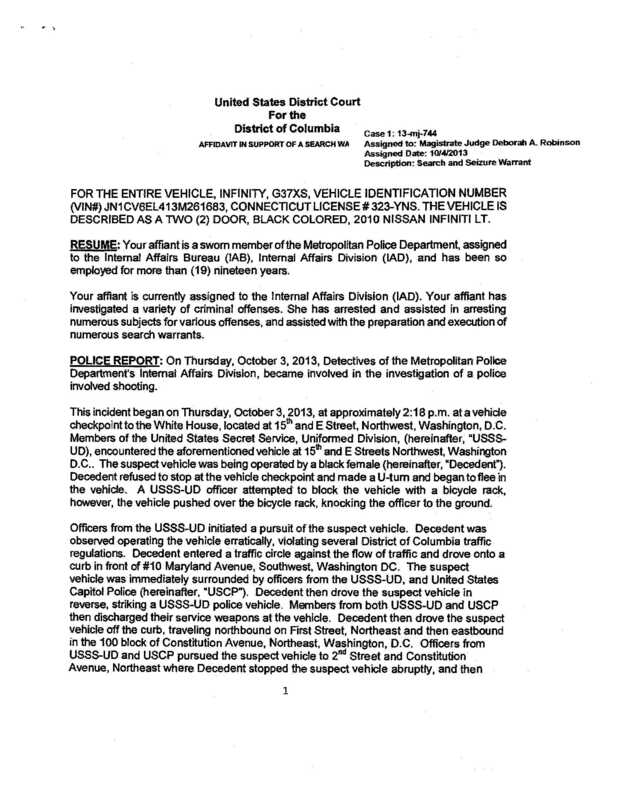 Officers from the U.S. Secret Service-Uniform Division and U.S. Capital Police fired shots at Carey, according to an initial police report (here in Parts 1 and 2). It is unclear if Carey was in her vehicle when she was fatally shot or if she exited the car and then was shot. Carey, a dental hygienist residing in Stamford, Conn., at the time of her death, was unarmed and her 1-year-old daughter was sitting in the back of her black Nissan Infiniti at the time of the fatal shooting. The child was unharmed and is currently in the custody of her father in Connecticut, Valarie Carey, Miriam’s sister, told NewsOne. Read more at http://www.wnd.com/2014/04/new-revelations-about-mom-killed-by-capitol-cops/#eLRCc20rf6oif0S4.99Carey made national headlines Oct. 3 after numerous reports suggested that she was trying to breach White House grounds or rammed barricades in restricted areas in downtown Washington D.C., but the police report does not indicate that such breaches took place. 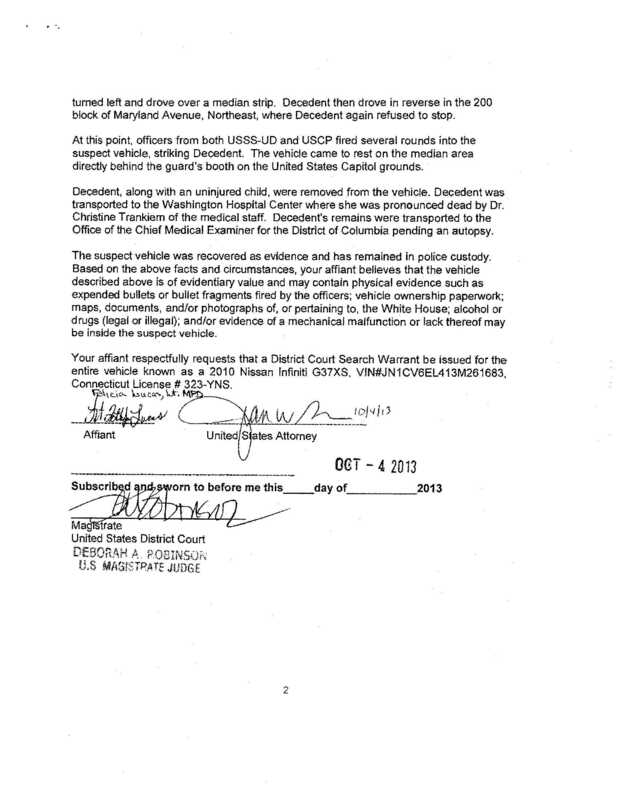 Read more at http://www.wnd.com/2014/04/new-revelations-about-mom-killed-by-capitol-cops/#eLRCc20rf6oif0S4.9Carey made national headlines Oct. 3 after numerous reports suggested that she was trying to breach White House grounds or rammed barricades in restricted areas in downtown Washington D.C., but the police report does not indicate that such breaches took place. Eric Sanders, the attorney who is representing the Carey Family and is a former NYPD officer, told NewsOne that the shooting was unjustified. The family has filed a $75 million wrongful death claim against the U.S. Secret Service-Uniform Division and United States Capital Police. $75 million wrongful death claim against the Capitol Police and the Uniformed Division of the U.S. Secret Service. There were also reports that Carey was mentally ill and was on medication. The toxicology report reveals that no drugs — prescription or otherwise — were found in her system. WND, a Washington D.C.-based news outlet that has been reporting extensively on the shooting from the very beginning, has filed numerous Freedom of Information Act requests asking for documents germane to Carey’s shooting. None of their attempts have been successful so far. NewsOne reached out to the U.S. Capital Police and the U.S. Department of Justice, who is also investigating the case, for comment. We will update this story once we get a response. Next week, NewsOne will also publish a longer exclusive story outlining how the family is dealing with the aftermath of Miriam’s death.